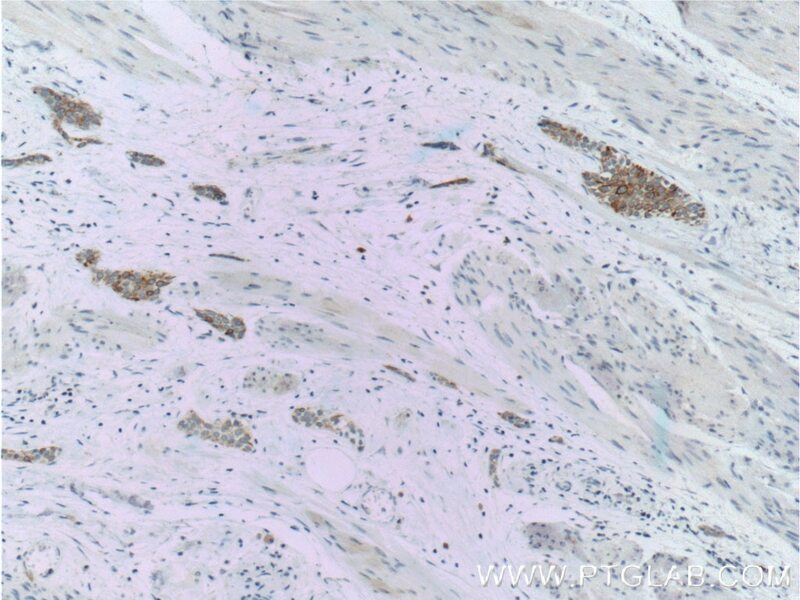 Immunohistochemical analysis of paraffin-embedded human colon tissue slide using 60183-1-Ig (Cytokeratin 20 antibody) at dilution of 1:51200 (under 10x lens) heat mediated antigen retrieved with Tris-EDTA buffer(pH9). 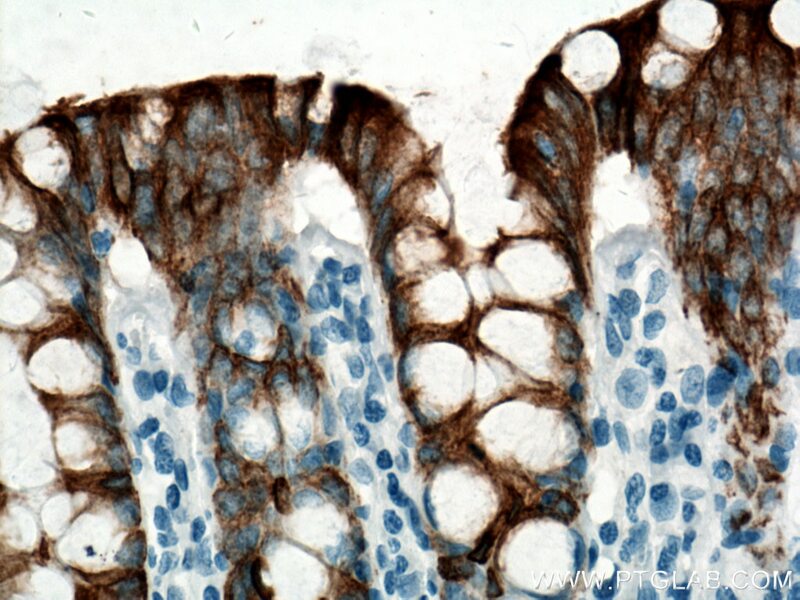 Immunohistochemical analysis of paraffin-embedded human colon tissue slide using 60183-1-Ig (Cytokeratin 20 antibody) at dilution of 1:51200 (under 40x lens) heat mediated antigen retrieved with Tris-EDTA buffer(pH9). Keratins are a large family of proteins that form the intermediate filament cytoskeleton of epithelial cells. Keratin expression is highly regulated, tissue specific, and varies according to cell-state. Type I keratins consist of acidic, low molecular weight proteins with MW ranging from 40 kDa (KRT19) to 64 kDa (KRT9). 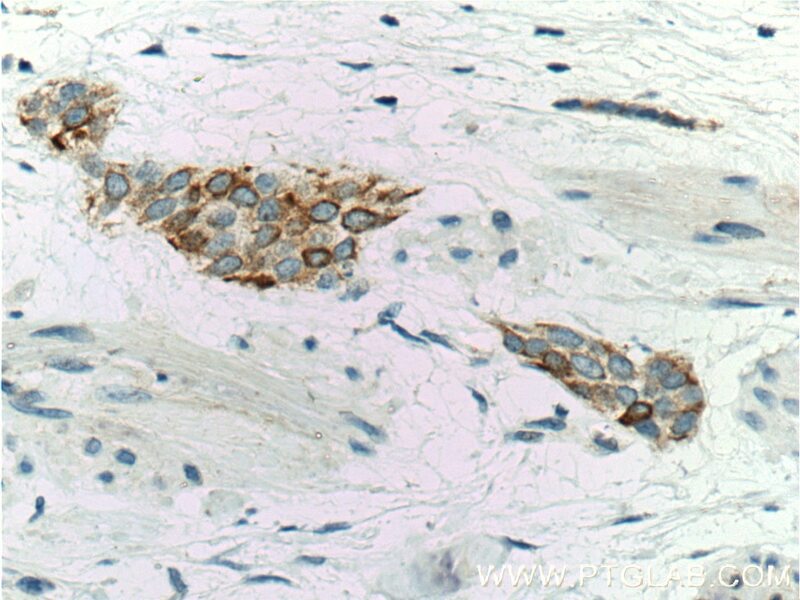 Type 2 keratins consist of basic or neutral, high molecular weight proteins with MW from 52 kDa (KRT8) to 67 kDa (KRT18).Keratin 20 is a type I cytokeratin. 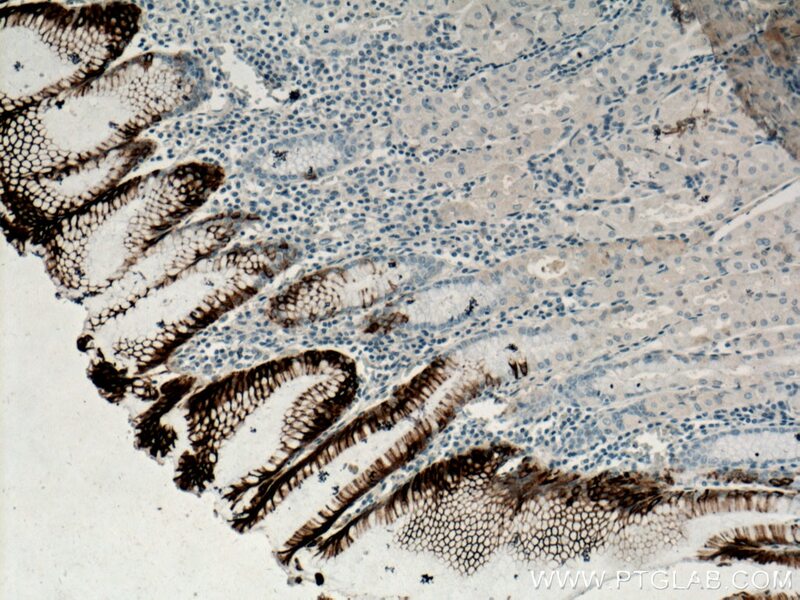 It is a major cellular protein of mature enterocytes and goblet cells and is specifically found in the gastric and intestinal mucosa. Construction of artificial human peritoneal tissue by cell-accumulation technique and its application for visualizing morphological dynamics of cancer peritoneal metastasis. 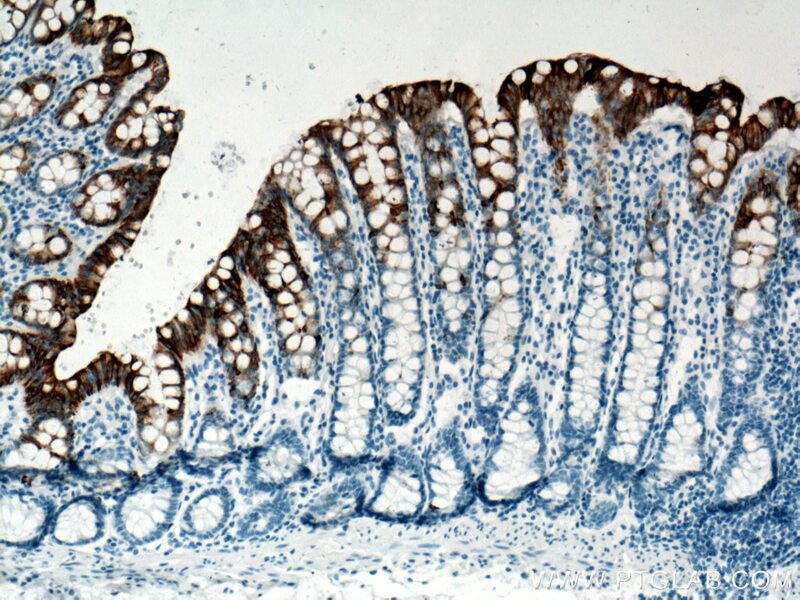 Immunohistochemical analysis of paraffin-embedded human stomach tissue slide using 60183-1-Ig (Cytokeratin 20 antibody) at dilution of 1:6400 (under 10x lens) heat mediated antigen retrieved with Tris-EDTA buffer(pH9). 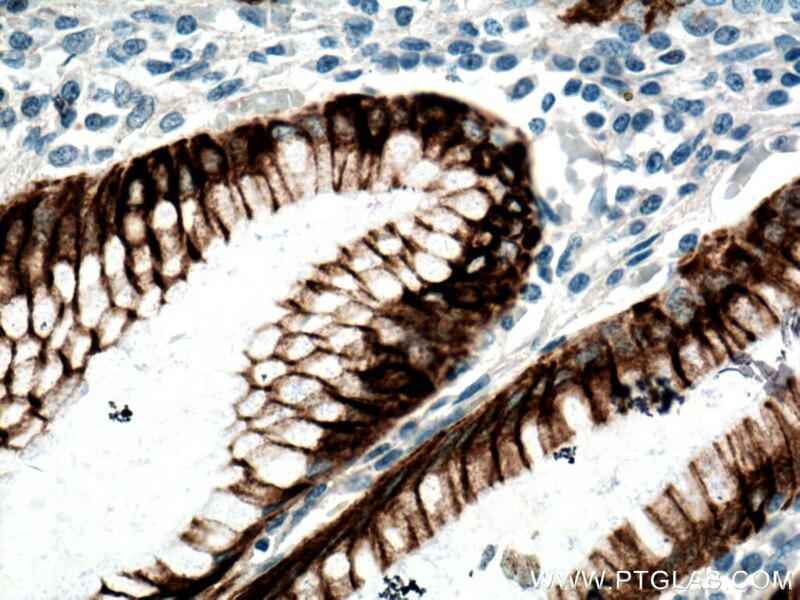 Immunohistochemical analysis of paraffin-embedded human stomach tissue slide using 60183-1-Ig (Cytokeratin 20 antibody) at dilution of 1:6400 (under 40x lens) heat mediated antigen retrieved with Tris-EDTA buffer(pH9).